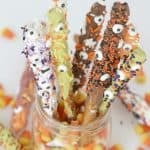 Scare up some delicious fun at Halloween with these Eye Of Newt Halloween Pretzels. This is a fun recipe the kids can help make too! Line a baking sheet with parchment paper. Place a baking rack on top. Set aside. Melt candy melts in microwave according to package directions. Our each flavor into a tall glass or you can leave in a glass bowl. Dip each pretzel rod into the flavor of choice. Randomly apply candy eyeballs. Sprinkle with "sprinkles". Set on the baking rack to dry.